Emilyn Stam plays the fiddle, accordion, and piano. John David Williams plays the clarinet and harmonica. Together they play traditional folk music from North America, Western and Eastern Europe, old New Orleans – style jazz, harmonica blues, improvisations and their own compositions. John studied classical clarinet at University of Toronto, then went on his own exploration of klezmer, old jazz, blues, and North American folk music. He is known for beautiful and often wacky clarinet sounds and his groovy harmonica playing. He fronts the bands The Boxcar Boys and the Roofhoppers. Emilyn grew up heavily involved as an accompanist and fiddler in the Valley Youth Fiddlers in Smithers BC under the mentorship of Oliver Schroer. She studied classical piano in the Netherlands, traveled around France playing for traditional folk dances and is known for her solo improvised piano album. In Toronto she keeps herself busy improvising music for clowns, performing in multiple diverse folk music bands, and organizing folk dances. Together and apart, they have toured across Canada, Australia, in the USA, and many countries throughout Eastern and Western Europe. As a duo they’ve played house concerts and concert series from BC to Quebec and Budapest to Berlin. Their soon to be released debut album was recorded in a barn in Chelsea, QC, in 2015 and features all original tunes. In their live show these tunes are contrasted with old folk songs from the Southern States, dance tunes from France, Klezmer traditionals and more. 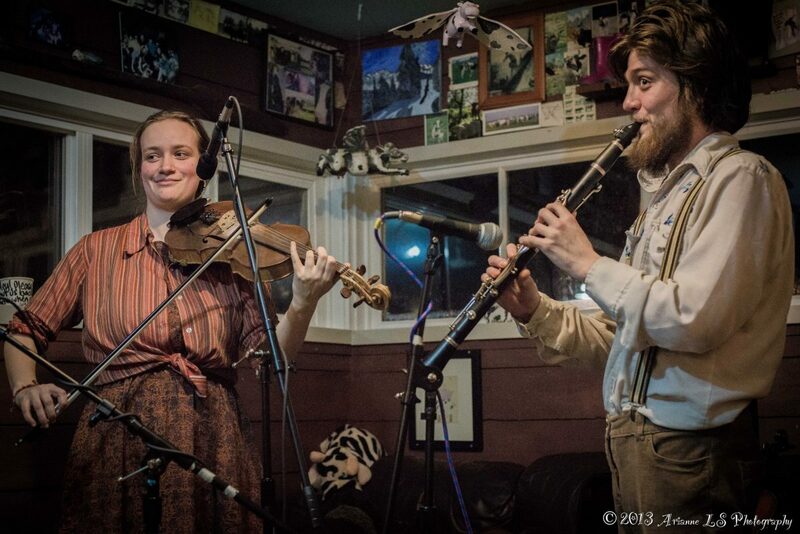 John and Emilyn met as members of bands Jaron Freeman-Fox and the Opposite of Everything and the Lemon Bucket Orkestra. Their musical relationship started when they would find a quiet place after rehearsal or between sets and improvise strange and beautiful music together. Later they discovered a mutual love for danceable traditional tunes and songs. Their duo show is always alive and evolving and spans this wide range of musical interests.